See my list (photo below). 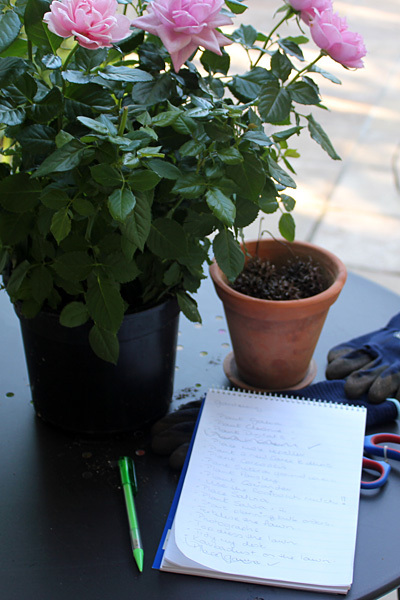 25 things on my gardening “to do” list. That is 25 things besides the usual cutting back, dead-heading, weeding, and other routine chores this gardener does has to do every week. See my blog post. I show a few scenes from my back garden. Alan from It’s Not Work, It’s Gardening comments “I’d love to see some more panoramic shots of your garden though, as it’s tough for me to get perspective. (email me if you want instructions on how to do that)“. I remember that about five other garden bloggers have made the same comment. Really, I’ve been trying, but it’s not so easy to do. An e-mail later and Alan very kindly sent me a list of recommendations of software to download to stitch my photos! (Thank you Alan!). I try the last one on his list which is AutoStitch for Windows. There is a “demo” app written for Windows which Alan says is very good and as simple to use as the iPhone version. http://www.photo-freeware.net/autostitch.php – Plus, it’s free. Combine the above three and you have a gardener that abandons the gardening chores and “to do” list and produces umpteen panoramas of her front garden. Oh my goodness, what fun I have had this afternoon! I can’t tell you how easy it was to download the software (a few seconds), read the readme file – easy peasy, start making panoramas! Nothing complicated, no big learning curve – just take photos and do! It was lots of fun to do and interesting for me to see the “bigger picture” of my garden. Amazingly, the “bigger picture” of my garden is so much more attractive than it was in my head. Alan, Thank you so much for introducing me to the software. I was attempting to do it all manually in Photoshop before and you are right, the results were always poor which is why I’ve never shown these wider views of my garden before. Today I’m showing my front garden. Well, it is actually the back of the house with a yard and back door that opens to the side street (we are on a corner plot). But we use this entrance for pretty much everything (and rarely use the other entrance). So Front Garden it is called and when I refer to any of these, they are located in my front garden and shown here: Gardenia Bed, Rose Bed, Lavender, Camellia Bed and the rest is not often referenced. (Click on the small images below to view the enlargements). From a different point of view have you thought of having some Tree surgery carried out, a crown reduction and or thinning. Its amazing how little removed from a tree increases the light level into a garden. Hi Don – Yes, we do it every year without fail. Last year we did radical cutting back and as you can see, it just grows back stronger. Removal is not an option, we love the trees. After a morning in the garden, I’m now catching up on blog posts. The wide view shows your garden both to and at it’s best! Christine, these really do give a greater perspective and appreciation of your garden. It is gorgeous! And now I can put all those gorgeous blooms into context. I understand the abandoning of to-do lists. At one time my lists were ignored to garden, but now, like you, I know all too well being distracted by photography. I am especially drawn to panoramas, and think that is how I see the world, not up and down, but side to side. It must have something to do with the ever present horizon. Unfortunately my panoramas do not always translate well to the computer. By the way, I am repeating my Winter Walk-Off (summer for you) and hope you will consider participating again this year. I really appreciated you perspective from another part of the globe. Hi Les – Absolutely for sure count me in. I had lots of fun with the Winter Walk Off last year – I’m so glad you’re making it an annual institution! If you would have asked me to draw a map of your garden based on previous photos you’ve posted, it would have looked nothing like this. Even ignoring the fact that THERE’S A SWIMMING POOL RIGHT IN THE MIDDLE I would have never gotten even close to this layout. And just to be clear, your FRONT garden is in the BACK, which is really the SIDE? I may actually understand that. I’m actually sitting here with a huge grin on my face – I feel so proud that you all think I have a nice garden – even when you see the full view of it. Thanks so much Alan for your help with this and also all the encouragement and advice over the past year! You’re an absolute sweetie for helping us so much! Those are fantastic! Your garden is beautiful and those panorama views are so helpful. Great to know the software is easy too. Hi Shirley! Thanks for the visit! The software was easy and it was fun to do! I love these panoramic views! And your garden looks magnificent! I have tons on my “to do” list, too – but it’s been raining off and on for days. But I’m not going to complain about the rain after last year’s drought! So glad to hear you are having rain Holley! What a welcome relief for all of you. Oh WOW!!!! This looks amazing!! Love the pano look and it actually stitches it all together seamlessly! Really lovely work here. Garden, house AND pool looking great! Can’t say the same about my garden. It’s the BIG clean up tomorrow and working up the courage to do it! Will do a post of it all! Thanks! We’re surviving the heat here!